This page covers advantages and disadvantages of Pick to Light System architecture. It mentions Pick to Light System advantages or benefits and Pick to Light System disadvantages or drawbacks. As we know inventory management is used for management of inventory and stock. It covers aspects such as monitoring and control of inventory, storage of inventory, ordering of inventory and so on. 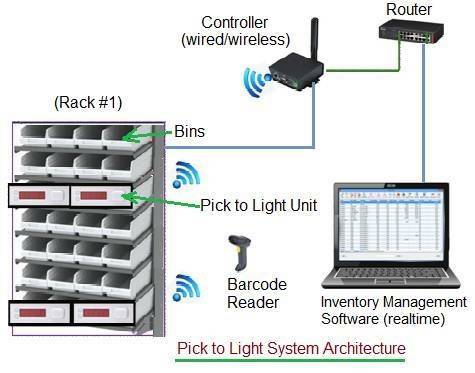 Pick to light, Put to light are systems which help in effective and efficient management of inventory. Following section mentions architecture, benefits and drawbacks of pick to light system. The Pick to Light (PTL) system is used in order picking environment. It enables order picker (man or woman) to quickly and easily find the correct location by means of lights or LED displays. Each tag represents an item in the storage location. Besides guiding the picker to the exact location, light displays precise quantity of items in the bins of rack. The system requires conformation while the item is picked. Another system called Put to Light works in reverse to the Pick-to-Light. Here items are picked from the warehouse and brought near to Put-to-Light System. The picker will scan/input the item and all bin locations which require this item will get illuminated. The picker will manually distribute the items to each locations and turn off the light after it is placed. As shown in the figure-1 Pick to Light System architecture consists following sub-systems. • Rack consisting of multiple pick to light units as shown in the figure-2. • Controller (Wired or wireless) for pick to light units. The figure-2 mentions single Pick to Light Unit. It houses Up/Down buttons, 3 digit display, LED display and Acknowledgement button. It is housed with Load cell or Force sensor which is used for measurement of weight of the materials placed in the Bin above it. The Pick to Light units can communicate with controller either using wired (RS233, RS485, RS422, Ethernet, Modbus) or wireless (GPS, Cellular, Wifi) medium. ➨It offers paparless picking process. ➨It streamlines the order fulfillment process. ➨It increases picking productivity drastically. ➨Picking accuracy is assured as it eliminates picking error to below 0.1%. ➨The Pick-to-Light system is easy to use. Picker can usually be trained in less time. ➨The system strengthens management control functions such as on line picking data control, easy to prompt material shortage etc. ➨The system performs well when picks are smaller and pick area is nearer. This helps pickers to concentrate on the work. For effictive management pickers are assigned on the picking tasks as per racks. ➨Wireless Pick to Light systems are prone to noise as well as hacking. Wired systems are also prone to hacking due to internet connectivity. This can be avoided using firewall or any other anti-malware softwares. ➨The wired Pick to Light systems have drawbacks respective to physical medium used such as RS232, RS485 or Ethernet etc. Indoor wireless systems such as wifi and bluetooth also have coverage range limitations. GPS chips work efficiently in outdoor environments instead of indoor environments. ➨In the event of failure of controller, the realtime inventory software does not get realistic information of the inventory unless the controller is replaced with the healthy one. To avoid this, redundant controllers or multiple controllers are required to be installed. Moreover controller should support multiple wired and wireless technologies.